This packable snack provides more than 90 percent of your daily requirement for vitamin E. For more antioxidants, try adding 1/2 cup dried cranberries, blueberries, or cherries. But be sure to watch portions — calories can add up fast with this snack. 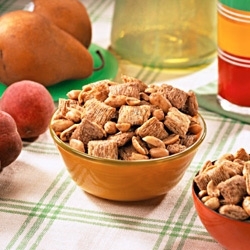 In a large bowl, combine the cereal, almonds, peanuts, and sunflower seeds, and mix thoroughly. Divide evenly among 6 zip-top bags.